The St Peter and Paul Fortress in St. Petersburg during the White Nights. How do you extend a carefree summer? Simply stay awake longer. 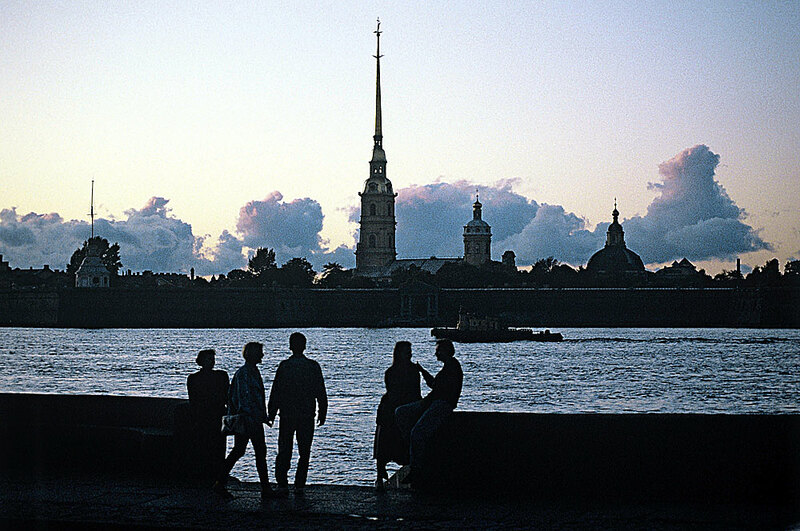 People in St. Petersburg know this best of all – the White Nights period lasts here from early June to mid-July. At this time, it is as if night never falls: The city lies steeped in twilight until the morning, and sometimes it is almost as light in the street as in the daytime. The city is often described as an "open-air museum of bridges." There are 342 of them in total, but the drawbridges are believed to be the most impressive ones. During the navigation period (April to November), you can see 10 of the city’s bridges open in two halves: Strictly on schedule, at about 2 a.m., the bridges are raised up, one by one. Some of them are raised and lowered twice a night. Crowds flock to the banks of the river Neva to see the spectacle. You can watch the bridges raised either from land or water – there are night water tours for this. You can go under the main drawbridges on a boat or ship – with music, dinner and a tour guide. Views of the Hermitage Museum, Summer Garden, Peter and Paul Fortress, the Bronze Horseman (a monument to the founder of the city, Peter the Great) and St. Isaac's Cathedral can be enjoyed from the water. You can also see the bridges drawn from above by sitting on the roof of one of the nearby buildings. For this, there are special night tours across the roofs of the old part of the city. The guides will show you secret places, take care of safety and even help arrange a romantic open-air rendezvous. St. Petersburg's only roof movie theater opens late at night. There you can watch European films in the original language, while wrapped in a blanket and with a glass of wine. If you don’t want to sit in one place, you can go for a walk around the main attractions of the city – admire the lights of the Admiralty and the Hermitage, stop at the Kazan Cathedral, turn past the Church of the Savior on Spilt Blood and reach the historic Field of Mars, where the eternal flame burns. Or, for example, you can climb 211 steps up a narrow spiral staircase and find yourself on the colonnade of St. Isaac's Cathedral with stunning views of the city – during the White Nights period, it is open until 4:30 a.m.
Sports enthusiasts can take a night tour on a bike or roller skates. The city has a skater and cyclist movement, which organizes a joint tour of the city every Friday. The route is about 30 miles and the journey takes about six hours, starting at 11 p.m. from Palace Square. Bikes, scooters and roller skates are available to rent – some rentals are open around the clock. After a walk, warm up in some of the city’s best-known bars. While the streets of Dumskaya, Rubinsteina and Belinskogo are known as "bar ghettoes,” there are great drinking holes to be found all over the city. The most popular places are Mishka, Khroniki, Stirka, Warszawa, Terminal, Union, Tsvetochki, The Hat and Poison. You can either do a bar crawl on your own or with the help of guides who run special tours where you can move in a group from one bar to another, performing competitive tasks. If you want to easily get to bed after a busy night, it is a good idea to line your stomach first. Early breakfasts are served at several cafes in the center. The PirOGI cafe operates 24 hours a day; Khochu Kharcho, Dlinny Khvost and branches of coffee chain Kofe Khauz are open for breakfast from 6 a.m. Having refreshed yourself, you can wait for the next white night – not a lot of sleeping goes on in St. Petersburg in the summer.